Since 200% last cast a jaundiced eye over Port Vale, plenty has happened but little has changed. Each week seems to have brought a new revelation of ill-behaviour from Vale’s board (my forecast that at least one director will come out as a woman trapped in a man’s body hasn’t happened… yet). And fans have almost unanimously called for them to push off… or be pushed out. Future ex-chief executive Perry Deakin, former chairman Peter Miller, current acting chairman Mike Lloyd and soon-to-be-ex-director anyway Glenn Oliver resisted all calls to do anything near ‘the right thing,’ including calling an Extraordinary General Meeting of Vale shareholders to defend their continued tenure. Exasperated fans have been led into battle by the recently-radicalised Official Supporters Club, which organised the Vale shareholders among their number to force the club to call an EGM, or do it themselves. The next ‘Battle for Burslem’ will therefore take place on March 13th. This EGM will take place as some sort of joint affair with the club’s long-awaited and twice-postponed Annual General Meeting, at which the club will present their soon-to-be-published financial report and statement of accounts to 30 June 2011. In the meantime, all signs point to a Glasgow Rangers-style collapse of club finances, while manager Micky Adams has somehow maintained Vale’s play-off challenge amid the chaos – an achievement of manager-of-the-year proportions if he keeps it up. 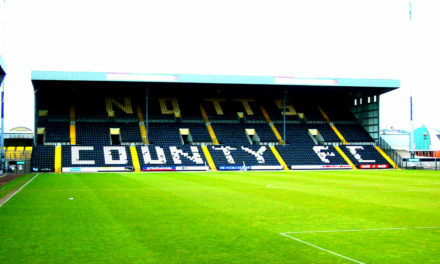 When this site was last in Staffordshire, there were suspicions that Vale had breached a significant loan agreement with Stoke-on-Trent city council when then-chairman, Peter Miller remortgaged the club’s Vale Park ground to cover a £277,000 loan from an offshore finance company, apparently without board consent… or even knowledge. Before those suspicions could be confirmed or denied, it WAS confirmed that Vale had defaulted on December’s monthly repayment. That repayment arrived at the end of January. But January’s repayment was late too. The agreement also stipulated that Vale should produce audited accounts by December 27th. Late again, then. In the slipstream of these announcements, Vale’s programme printers and shirt sponsors revealed that they are both in legal dispute over various financial agreements. Claims have been made that the board “snubbed” local MP Joan Walley’s attempts to “open a dialogue with the club” over its finances – although Walley herself appeared to suggest differently in a local radio interview. And the board also face more moral pressure, as it seems they intend to use the voting rights attached to the shares issued to Deakin and Miller on a “nil-paid” basis (i.e. they’ve paid “nil” for them, so far anyway) at the forthcoming meetings, as legally entitled. The first function of this four-strong body will be to keep the club running at all, let alone properly, as four directors are a constitutional requirement. Their next function will be to assess the true state of the club’s finances, possibly from behind a settee, as the story told by the 2010/11 accounts becomes more outdated by the day. And finally…if administration doesn’t beckon, Glasgow Rangers-style, the board will seek and evaluate interest in taking over the club, to the point of identifying a preferred bidder. The bald facts are, as ever, not the whole story, although it could be argued that there is a considerable duplication of indignation being heaped on Vale’s board. Morally, the board must go – on that there is no credible debate whatsoever. But company law has no morality clause. And the above disputes are, mostly, more nuanced than disaffected fans and the local press are prepared to admit; and they all stem from one problem only, which is hardly a unique problem in lower-league football – Vale are skint. The council loan repayments issue is clear-cut, Vale are defaulting. But the authorities know the money – monthly repayments of £19,616 including interest – just isn’t there. “If we called in the loan, we would be unlikely to get the money back anyway,” noted Sarah Hill, the council’s cabinet member for finance, correctly. Lloyd told BBC Radio Stoke on February 7th that repayments, including the already overdue January one, will be made “as cash-flow becomes available.” There is, genuinely, little more that can be promised in the circumstances. The dispute with programme printers, Regal Sports, is where nuance really kicks in. Regal co-owner Peter Davies claimed that the financial deal to produce the programme was based on projected sales figures, supplied by Vale, which were “grossly misrepresentative.” As a result, Regal threatened legal action (unspecified in news reports) against the club. And when that didn’t inspire a response, they withheld a contracted payment which, wholly unsurprisingly in Vale’s straitened circumstances, inspired an immediate response. The “grossly misrepresentative” figures from Vale included a claim that last season’s programme “generated a net turnover of £72,000.” On that basis, Regal set what Davies believed to be “a conservative target” of 1,000 sales per match. Davies now believes the “club staff,” who told him “after the deal was signed”, that sales were barely half that on good days. And Regal refused to pay a £20,000 fee due for the right to produce the current season’s programme. Again, unsurprisingly, those hopes were wildly optimistic. And whilst a Harlequin spokesman was “not prepared to comment on the details of the claim”, Deakin’s response, “I fully expect the matter to be resolved within 14 days,” betrayed an overhanging threat of lawyers – “14 days” sounds like a formal, specific deadline. Deakin claimed Vale were “in the process of trying to clarify exactly what the (loan) terms were” which seems rather pathetic given that Harlequin’s “legal papers” (from which the local press quoted) would, you’d assume, contain those terms. But it is unclear from the outside what “change in control” actually means. The board’s personnel have radically altered. But the “Valiant 2001” organisation, which has controlled the board since it bought Vale out of administration in 2003, still does; wresting that control from them is the whole purpose of the EGM. If Vale’s past is nuanced, its future could be very clear…or short. Vale Supporters Club miss no opportunity to, correctly, append “discredited” to “board” in communications, much as I only describe the repugnant Jack Warner as “the repugnant Jack Warner” (see?). (Incidentally, the excellent new website www.getoutofportvale.co.uk has published tales of Miller’s exploits in the repugnant Warner’s native Trinidad. Even the repugnant Warner might have thought “ooh, that’s a bit much” of some of Miller’s “work” there). The shortlisted candidates are, of course, all of one mind about the past. But there is also unanimity about the future – not least that it should be guided by another long-standing cast member in this saga, local businessman Mo Chaudry. Chaudry opponents claim that any such board would be conflicted “from day one” in choosing a future Vale bidder by their support – some of it very publicly stated – for him; and that he would be presented to shareholders as another fait accompli. One fan even asked if former directors such as Bratt would get a fair hearing if they “turned up with a new consortium and a seven-figure cash injection” that was somehow in shareholders’ interests. It was a scenario to stretch the definition of “hypothetical” to its limits, given Bratt’s investment record. But it was a fair question. The Sentinel selective in it’s choice of “news” shock? Well it’s hardly surprising since Martin Tideswell, the Assistant Editor is a leading light in the Supporters Club. That’s the Sopporters Club using £250k-worth of Robbie Williams shares since the dithering crooner copped out of voting against the board and handed his equity to “the fans”. With over 1000 registered members (admission is free) that’s over £200 per member for those who have shelled out not one penny on legitimate shares. I’ve registered Sticky, my pet stick insect. That means he has 4x the shareholding of those who, back in 2001, shelled out the minimum £50 to save Port Vale from oblivion. Democracy, Port Vale style. Well done on an informative and excellent appraisal of the current situation at Port Vale with one exception. Speaking as a Port Vale interim board candidate, discussions on any future role involving Mo Chaudry have not, at this stage been discussed. Erm… what? How would this be ‘ill-behaviour’? Or is this just an attempt at a joke at the expense of trans people? Please do better. You are right, of course. I do understand that no formal discussions have taken place among the interim board about Mo Chaudry’s future role and would hope that it is not to be assumed that he has one. After all, no-one’s been elected yet. I was just reporting what his opponents have been saying recently…which has included the suspicion that a future role for Mo Chaudry IS assumed. If you make it onto the board, I wish you and whoever your colleagues are the very best of fortune. Bad drafting on the sub-editor’s (i.e. MY) part. I was just referring to possible revelations, not specific revelations of ill-behaviour. If any offence was taken, it was certainly not intended and I am happy to apologise. Must do better, indeed. Thanks for your response Mark, much appreciated. Thank you for your good wishes Mark but with today’s revelations (28.02.12) it’s anyone’s guess what will happen next. – We travel in hope.